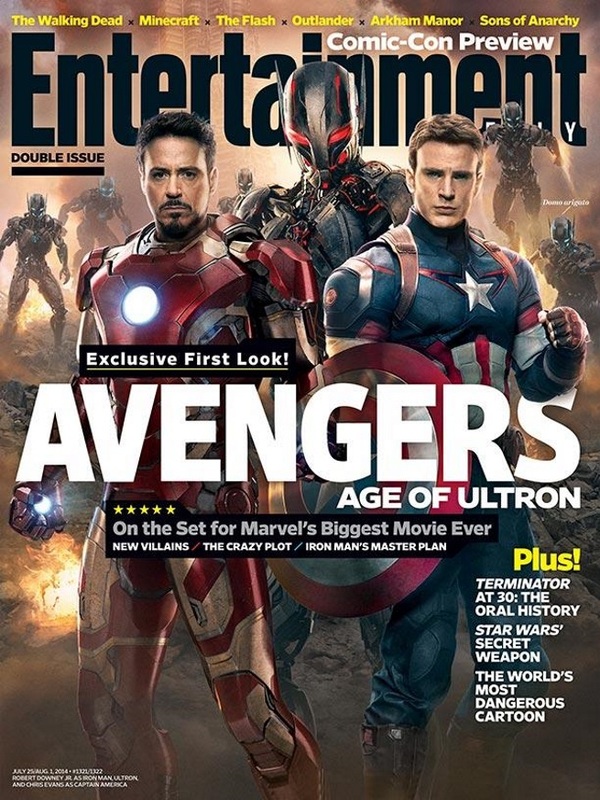 Avengers: Age of Ultron is on the cover of the newest issue of Entertainment Weekly, giving us our first look at the villainous Ultron in the film. They cover shows Iron Man (Robert Downey Jr.) and Captain America (Chris Evans) standing in front of the sentient AI’s physical form, with an army of Ultron drones marching forward from the background. Sadly, it's not a full-body view, and it's not exactly an action shot, but it is our first stylized look at the menace that'll be lighting up movie screens next May. Now, let's see if Comic-Con brings us even more Ultron awesomeness. Speaking about the film’s story and themes, the stars say it will be about how the Avengers are forced to deal with the negative side effects of heroism. “The downside of self-sacrifice is that if you make it back, you’ve been out there on the spit and you’ve been turned a couple times and you feel a little burned and traumatized,” says Downey. The preview for the issue also reveals Ultron’s origin in the film. Tony Stark creates Ultron as a force for good, a tool to allow him and the other Avengers to take a break without letting the world down. Obviously, things don’t go as planned. Avengers: Age of Ultron comes to theaters May 1, 2015.